The rent at La Bella Vita Apartments ranges from $1,245 for a one bedroom to a $1,950 three bedroom. Apartments in this building are about 1% less expensive than the Briargate average. This is a pet-friendly apartment. This apartment is in the Briargate neighborhood in Colorado Springs. Nearby parks include Castlewood Park, Tom Kelly Grand Lawn and Public Demonstration Gardens and Happy Meadows Park. La Bella Vita Apartments has a Walk Score of 31 out of 100. This location is a Car-Dependent neighborhood so most errands require a car. 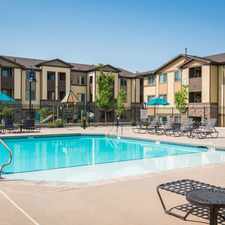 La Bella Vita is a Colorado Springs Apartment located at 4986 Amarosa Heights. The property features 1 - 3 BR rental units available starting at $0. Explore how far you can travel by car, bus, bike and foot from La Bella Vita Apartments. View all Briargate apartments on a map. La Bella Vita Apartments is in the Briargate neighborhood. Briargate is the 41st most walkable neighborhood in Colorado Springs with a neighborhood Walk Score of 28. Stunning 3-Story Home Located Close to Shopping In Banning Lewis Ranch!